Weekly Photo Challenge: Beneath Your Feet. Edgar Rice Burro is right to be concerned. 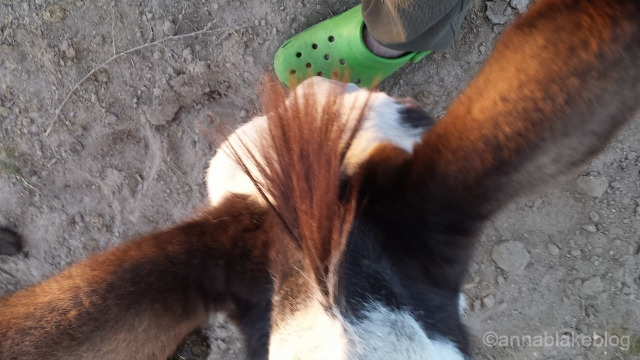 These lettuce-colored Crocs (beneath my feet) are not safe barn-wear. They say a lot about my fashion sense, too, but bite your tongue. Yes, I am a woman of a certain age and yes, I am about to complain about my feet. I have developed a lameness; I’m off in the left front. It feels like a bone is coming through the bottom of my foot. I’m pretty sure it’s Navicular. So don’t judge me. Consider the Crocs corrective shoeing and call it good. Available now: Stable Relation, a memoir of one woman’s spirited journey home, by way of the barn. It’s the story of the farm I grew up on, the farm I have now, and the horse who carried me in between. Available at all online book sellers now. To get updates and the inside story, sign up here: Prairie Moon News. Thank you. As another woman of a certain age (plus! ), you might want to try taking B12. Dandy, I’ll give it a try. At a certain age, I do usually look at supplements in the barn. I’ll try that in the house. Thanks. I love reading your blog every week. Love your perspective on things.. Love your humor!! I am with you and lame on the right hide. Crocs are the only footwear I can walk sound in. I am an aged mare so broodmare sound doesn’t really work either. Oh, geez louise, glad I’m off the hook for broodmare duty as well! Thanks, my slightly lame sister! Edgar is struggling with a nasty case of thrush right now. Wish I had some donkey Crocs for him. Thanks for your comment. Had bunions on both feet up to a few years ago – had the surgery – back to wearing shoes in my normal size now! Can sympathize completely with the lameness issue. So glad when I was gainfully employed & wearing heels – they weren’t the horrible pointed toe things that are out there now! Never wore heels or flip flops. Have been stepped on a few times. Glad you’re better. I fell yesterday, and had to have stitches in my left hock. Also injured my right hoof and had to have it wrapped. Since I didn’t bite the vet, my person allowed me a Starbucks on the way home. Your pain could be plantar faciitis. Mine started last summer. Dr. told me it was due to overuse of flip flops. Most of my summer footwear is backless so I was not pleased. All but paddock boots of course She gave me stretching exercises and I did them every day. Amazingly the pain became much reduced, but returns a few days after I stop the exercises. And I no longer wear flip flops 🙁 A friend suggested K(kinesiology)-tape and it works much better. Also is helping my painful knee. I think the foot pain affected my gait and caused the knee pain. Has K-tape been used on horses? It is magic. Ice helps as well, just like it helps our horses. I love ice, but I know it is not the same for all. I hope your foot pain gets better. Looks like you have a good therapist in Edgar. Always wear Ariats, but I’m on my feet a whole lot. Thankfully, Edgar does look at me with a very concerned expression. Especially at meal time. Thanks for the suggestion, I’m looking up K-tape. Pretty sure it’s not Navicular. Might be rotated coffin bone. I have the same thing! Get good metatarsal support and arch support…..chiropractor and good shoes, not crocs! Feels like your walking on your bones, burns, aches. Cortisone injection offered brief relief but is more damaging than good…4 years and mine are better but not fixed! Thanks. I have orthodics but maybe I need to update them… If yours are like mine, every once in a long while something flares up… and ouch! I would like to call your attention to plantar warts. One will feel just like you have lost all your foot’s padding! Easy cure w/ OTC med. I developed a bunion on my left hoof. At first I wallowed in self pity, bunions are for OLD nags! I perked up considerably when I realized I could go through all my shoes and discard any that were even marginally uncomfortable and have a wonderful excuse to by new ones! Yes, my name is Sherry and I’m a shoe-a-holic…… Winston Willowby Donkey also peers at me with great concern at times. This bunion talk is interesting to me. I had my first (and only child) at age 31. My feet were fine until I got pregnant and became very front-heavy (the kid weighed 10 pounds). I developed enormous bunions and have had them ever since, even though I have been a comfortable-shoes gal my whole life. I started paying attention to how the weight was distributed on my feet when I was walking and standing – and made a more conscious effort to put more on my heels. It is amazing how just doing that changes what muscles you have to use to stay upright. I suspect that this is somehow connected to the change in my riding abilities, and the fact that I am continually forward when I feel like I am vertical. I nearly ruined my sensitive mare by riding her with this too-forward problem – my body was telling her one thing – the opposite of what I thought I was asking her to do. Interesting to correlate it to position in the saddle, I do know how hard that is for horses. Great comment, thank you.